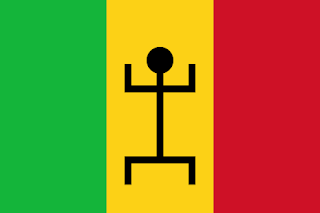 Mali was, originally, French Sudan. Whilst it was part of the French Empire. 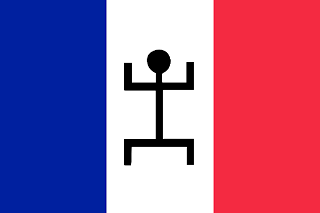 From 1920, to 1959, French Sudan used the French tricolore flag, with a depiction of a man in black (Kanaga) placed on the central white stripe. In 1959 French Sudan was merged with Senegal to make the Mali Federation. An independent nation within the French Community. And entirely independent early in 1960. The flag took the tricolour design, and used the pan-African colours of red, yellow, and green. The flag kept the Kanaga figure on the central yellow stripe. The flag itself was an imitation of the flag of Ghana. But vertical. 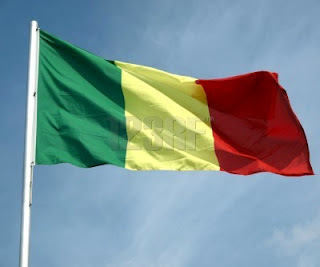 In August 1960, due to political disagreements, Senegal split from the Mali Federation, adopting its own flag. Mali kept the Mali Federation until 1961. In 1961, the Kanaga figure was dropped due to Islam's aniconism. Its stance against drawing depictions of the human form.